Today, you are a member of... Your Soft Machine - You Are A Member! 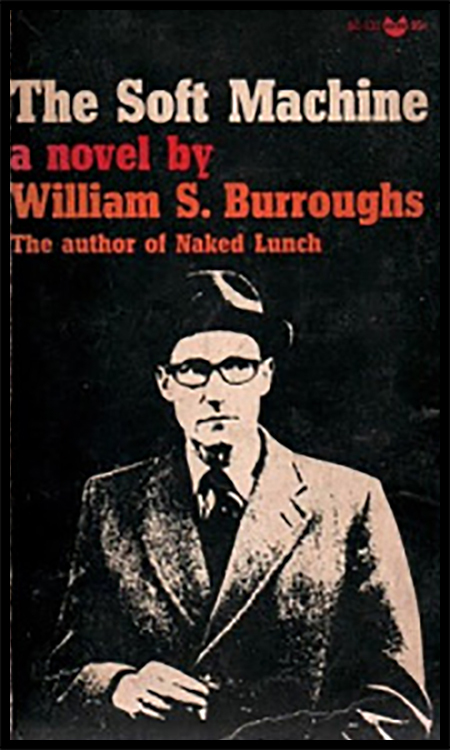 Let’s all nod in sardonic, monitoring fashion, to one Mr. William S. Burroughs, whose birthday is today. And let’s dwell for a moment on his book, The Soft Machine – a palimsest, cut-up thing that came out in four (very different) editions, and though inspiring both a band from the British Undergroudn and a Doors album, is not one of his more often cited volumes. The book is about a lot of things (and unthings) but quite frequently cited is a plot involving time travel, dickish Mayan priests, a calender translated into sound via magnetic tape that enslaves a bunch of people so they keep planting corn, and a secret agent who topples the whole dogmatic mess by replacing the content of the magnetic tape with something a bit more subversive. This diegesis really only comes across in one chapter, while the rest of the text involves falling percepts engineered in a random fashion. This week, Members, you may find jumbles of unconscious associations collected in jar and left by an unidentified party on your front stoop. Or you may find a tiny narrative amidst the din, one that has decidely sharp teeth. Either way, it’s al part of the same book, so best to understand the text-based galactic systems living inside your soft machine.